NatGeo's Doomsday Preppers is a documentary series about people preparing for the end of the world, hording supplies, learning survival skills and building elaborate shelters in the hopes that when the big day comes the four horse-persons of the apocalypse might pass them by. In celebration of tomorrow's launch of the show's second season, G5 Games has created an incredibly appropriate video game tie-in. 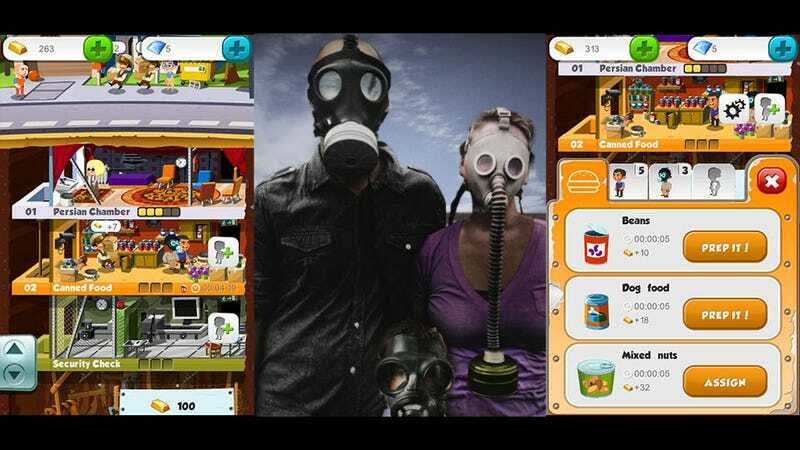 Available now on iTunes, Doomsday Preppers the game is the incredibly addictive and oft-copied Tiny Tower, only instead of building up the player is digging down, crafting sub-floors dedicated to security, shelter, recreation, crafting, food processing and science. Preppers line up on the surface, ready to descend the elevator and be assigned a task. Delivery men show up with supplies, and they never leave—they just mysteriously disappear. I'm guessing they are being used for food. Say what you will about cloning winning formulas, this is the only way a Doomsday Preppers game would have made sense, and it works amazingly well. As an added bonus, codes for game content will be distributed during new episodes of the show, giving fans extra-incentive to play what they watch and watch what they play. Very well done.